The resonance of these words would soon be hugely amplified when the American Civil War brought a severe cotton famine to Manchester and its surrounding towns. In 1863 – the year that would see Ira Aldridge become a British citizen – our city experienced its proudest moment when President Lincoln wrote a letter of thanks to its working people for pledging their support to the Union’s pro-abolition cause. He promised that their suffering would not be in vain but instead would become the foundation for the “ultimate and universal triumph of justice, humanity, and freedom”. Following the Royal Manchester Institution’s first art exhibition, in 1827, this recently completed James Northcote portrait became its much treasured initial purchase. It is possible that the acquisition honoured Manchester’s anti-slavery movement, but we cannot be certain that this was wholly the intention. Merchants made up a large part of the Institution’s membership and in all likelihood, they too were divided on the question of immediate abolition. A complementary explanation may lie in the fact that even before Ira Aldridge’s 1827 arrival in Manchester, he was being hailed as the ‘African Roscius’ – after the great Roman actor. During his two-week residency here, he had leading parts in four different plays. Intriguingly, our portrait was bought a mere six months later. Now on Display in Gallery 5. 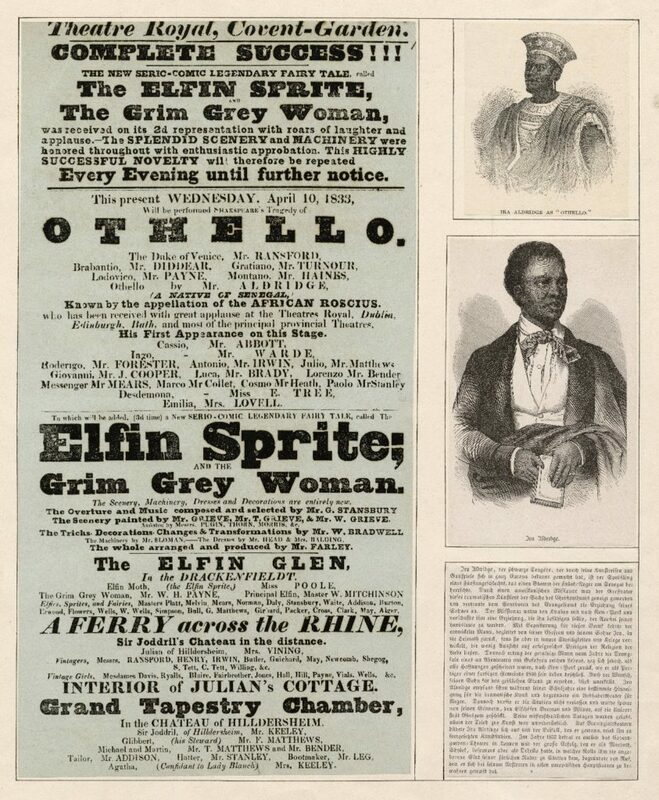 Ira Aldridge went on to play many great Shakespearian roles including King Lear. But he was best known for being the first black actor to play Othello. It was his Othello that he brought to Manchester in 1827 and would eventually reprise to great acclaim in St Petersburg. And of course it is as Othello that we see him here. The painter James Northcote, a great admirer of the theatre, has captured Aldridge in an eerie glow set against a dramatic sky. The light illuminates an acute sense of uncertainty, especially in the momentary sideways glance. Is this the character – Othello – who has just been given false cause to doubt the fidelity of his beautiful wife, Desdemona? Is this the very moment in which the malevolent Iago, utters the notorious line from which such murderous consequences will ensue? “O beware my lord of jealousy; it is that green-eyed monster that doth mock the meat it feeds on." Or is this the young actor reflecting upon on an astonishing journey of learning and achievement as well as upon his own destiny in a potentially hostile world? And we too are left to reflect on what our first masterpiece can still open up for us – the darker parts of own history, Manchester as the vanguard of progress, and the power of individual endeavour in overcoming base prejudice. All of these things seem to be underpinned by the timeless resonance of Shakespeare. And like so many great works of art, our painting here sparkles with mystery.